This is a humorous, colourful and thoroughly piratical version of the Clement C. Moore classic. Young mateys will love the rollicking rhymes and sprightly, fun-filled pictures. It is suitable for children aged 3 to 5 years old. Young mateys will find plenty of holiday joy in this humorous, colourful and thoroughly piratical version of the beloved Clement C. Moore classic. On this ship of mischievous brigands, who have visions of treasure chests, not sugarplums, dancing in their heads, you wouldn't expect a visit from nice St. Nick. Instead, here comes Sir Peggedy, with his peg leg and hook arm, cracking his whip and driving eight giant seahorses: Salty, Scurvy, Sinbad, Mollie, Cutthroat, Cross-Eyes, Roger and Jolly. Philip Yates' rollicking rhymes and Sebastia Serra's sprightly, fun-filled pictures turn this Christmas perennial into a jubilant celebration! 10/13/2008 Marilyn Panton said: Nice twist on an old classic. Kids love pirates and humour is always in season. Love the names and the spirit in which the book was written. 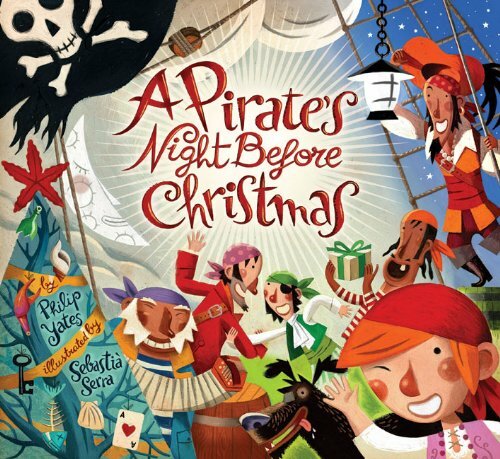 Christmas is a time for treasure and celebrating on a pirate ship has got to be good.